Price Boost - 33/1 Liverpool to beat Man UTD at Coral! 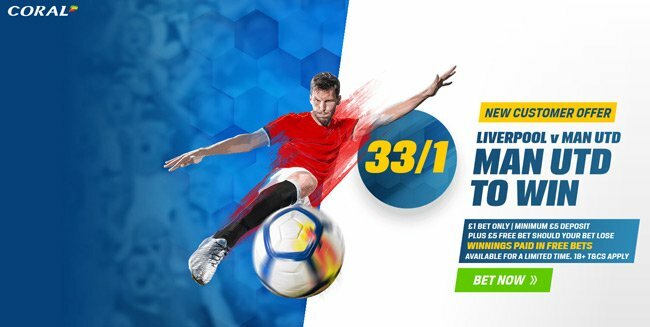 Coral Sportsbook is celebrating the return of the Premier League after the international break by offering a tasty 33/1 Liverpool to win vs Manchester UTD + £5 free bet! A bet of £1 on Liverpool to win will return a £33 net profit! Liverpool are seven points behind Manchester City and Manchester United and cannot afford to lose more ground here. The Reds have drawn the last 3 matches in a row against Man UTD. Fancy a Liverpool victory this Saturday? Claim a 33/1 price boost at Coral in few simple steps! Join Coral before the kick-off on Saturday (12.45pm) for 33/1 Liverpool to beat Manchester UTD instead of the normal price!! Make your first deposit of £5 or more and your enhanced odds will appear on home page - 33/1 Liverpool to win vs Manchester UTD! Coral are offering all new custoemrs registering via our site a 33/1 boost on Liverpool to beat Manchester UTD! Claim here your crazy boost in less than 2 minutes! Open a new Coral online or mobile account and bet on Man United to win against Liverpool - 33/1. 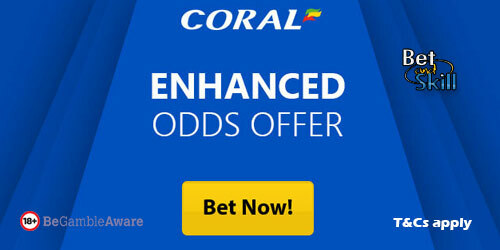 Offer available to UK & Republic of Ireland residents aged 18 years or over opening a new Online, Mobile or Coral Connect account in either £/€ currency through https://promotions.coral.co.uk/landing-pages/crazy-prices4, https://promotions.coral.co.uk/landing-pages/crazy-prices-online4 or the specific offer promotion box from coral.co.uk/sports/offers, between 08:00 BST Wednesday 11/10/2017 until 12:30 BST Saturday 14/10/2017 with the exception of new accounts depositing funds with Moneybookers, Paysafe, Neteller or Skrill. Place your FIRST real money bet as a win single £/€1 on ‘Man United to win 33/1’ in our “My Markets” sections. "Price Boost - 33/1 Liverpool to beat Man UTD at Coral! "